Stress, whether physical stress or mental stress, has been proven to instigate changes in blood sugar levels, which for people with diabetes can be problematic. Simply out, stress is a state of emotional strain or tension that occurs when we feel that we can't cope with pressure. When we become stressed, the body quickly responds by releasing hormones that give cells access to stored energy - fat and glucose - to help the body get away from danger. This instinctive physiological response to perceived threats is known as the "fight-freeze, or flight" response. Over time, both physical and mental stress can wear us down mentally and lead to depression and other mental health issues. We live in a very stressful society which is constantly putting us under pressure. This pressure can sometimes be too much to handle, leading us to feel "stressed out". Being told you have diabetes, or any serious chronic condition for that matter, can also cause a lot of stress and pressure. This can make it harder to control blood sugar levels which, in most cases, only adds to the frustration and stress. How does stress affect my diabetes? It is widely recognised that people with diabetes are who regularly stressed are more likely to have poor blood glucose control. One of the reasons for this is that stress hormones such as cortisol increase the amount of sugar in our blood. High levels of cortisol can lead to conditions such as Cushing’s syndrome, which is one of the lesser known causes of diabetes. Constant stress and frustration caused by long term problems with blood glucose regulation can also wear people down and cause them to neglect their diabetes care. For example, they may start to ignore their blood sugar levels or simply forget to check them, or they may adopt poor lifestyle habits, such as exercising less, eating more 'junk' and processed foods, drinking more alcohol, and smoking. This is known as diabetes burnout. While stress alters blood sugar levels, the extent of its impact varies from person to person. Studies into the effects of stress on glucose levels in humans have shown that mental or psychological stress causes a rise in glucose levels in people with type 2 diabetes and in most type 1 diabetics, although levels can drop in some individuals with type 1. Physical stress, such as illness or injury, almost always causes blood sugar levels to elevate in people with either type of diabetes. How do I know whether stress is affecting my glycemic control? A simple way to do this is to rate your stress level on a scale of 1 to 10 every time you test your blood sugar levels. Make a note of this number and next to it write down your glucose reading. By doing this consistently for a few weeks, a pattern should emerge that allows you to see whether high levels of stress coincide with high glucose levels, or vice versa. What is the fight-freeze or flight response? The fight-freeze or flight response is an evolutionary coping mechanism enabling us to deal with threats and stressful situations. When confronted by a threat, hormones are released that help us get ready to either fight the threat or fuel a quick escape. There is an increase in glucose for energy, increased blood pressure to take fresh oxygen to working muscles, and the release of adrenalin for heightened vigilance and alertness. The "freeze" factor has been introduced in recent years as theories have been put forward as to why people sometimes "freeze" in a hopeless, shocking situation. It is possible that this 'rabbit in headlights' reaction is similar to playing dead, which could have helped our ancestors avoid attacks in the wild. Modern humans have fewer physical threats, but when faced with psychological pressures such as getting stuck in traffic, the brain and body still behaves in the same manner as when faced with a physical threat (i.e. the fight-freeze or flight response). However, in people with diabetes this instinctive response does not work as well. Insulin is needed to get stored energy (glucose) into the body's cells. But in people who have diabetes, this process is hampered as insulin is either not produced (as with type 1 diabetes) or not used effectively (type 2 diabetes), resulting in the build-up of excess glucose in the bloodstream. 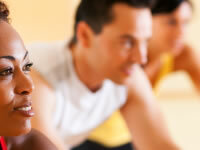 The ultimate aim of these exercises/activities is relaxation, which is key to controlling stress. In the UK, the NHS advise to build up to 150 minutes of aerobic activity, such as jogging or brisk walking, each week. Moving your body through a wide range of motions can also give the mind a rest from the pressures of everyday life. Some people find this relaxing as the mind is preoccupied with exercising rather than worrying about any problems in life. How does mindfulness meditation alleviate stress? Mindfulness meditation is the art of becoming aware of our present moment experiences, including thoughts, emotions and sensations in a non-judgemental and accepting manner. Mindfulness meditation courses have been shown to significantly reduce stress, anxiety and panic attacks in people who are diagnosed with chronic stress and anxiety disorders such as Seasonal Anxiety Disorder (SAD). Specifically, research studies have also shown that mindfulness can help people who have diabetes improve their blood glucose control, reduce their blood pressure and enhance their overall quality of life. The research suggests that by simply accepting or acknowledging destructive emotions in a non-judgemental way, as opposed to suppressing them or trying to change them, people with diabetes are able to better regulate their blood glucose levels and cope with the mental strain of constantly treating themselves. Simply alleviating the consequences of stress will not stop it altogether, but it may be possible in your situation to stop or prevent the things that stress you out in the first place. Traffic - Avoid traffic by commuting on a different route or by leaving home/work at an earlier time, if possible. Work - Speak to your employer about making improvements to your work load if you are struggling to cope, or apply for a transfer. In some cases, it may be best to seek a new, more enjoyable role elsewhere. Relationships - Not getting on with relatives or loved ones can cause a persistent overbearing feeling of stress. Try taking the first steps to resolving any long lasting conflicts and mending your relationships. Try something new - Taking up a new hobby or learning a new craft may introduce a positive factor into your life, which could be just what you need. Managing diabetes - If aspects of your day-to-day management of diabetes make you feel stressed, talk to your GP or a member of your diabetes team about these issues. You could also try joining a support group where you will be able to make friends with other people in the same situation and pick up tips on how to reduce the burden of diabetes-related stress.